We’ve always believed that the collective decisions made by our community of long-term investors is worth huddling over … a place where ideas are born. Your MANIFEST 40 is a tracking portfolio of the forty most widely-followed stocks by the community of long-term investors at Manifest Investing. Apple (AAPL) continues in the pole position in our quarterly update. One of the biggest surges comes from Bio-Reference Labs (BRLI) as the company moves from #7 to #3 in the new rankings. Microsoft (MSFT) slipped from #4 to #6? Coach (COH) also has been quite popular of late — since the price pulled back — and has moved from #18 to #10. It is here that our community shines. 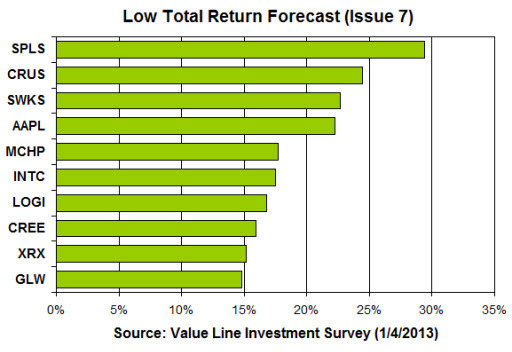 The average annualized RELATIVE return for the current tracking portfolio is +4.5%. (The absolute return for the tracking portfolio since inception is 6.3%.) The accuracy rating (% of outperforming picks) of the current selections is 62.2%. (!) 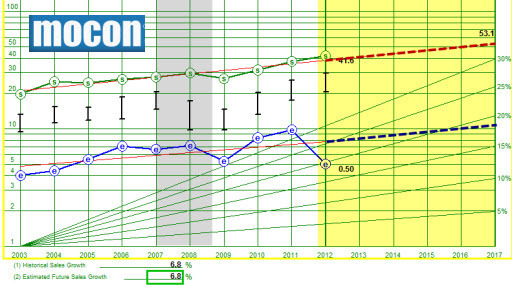 Including all selections since inception (7.25 years), the annualized relative return of the MANIFEST 40 is +3.3%. The figures in parentheses are the position of the company during the September 2012 listing of the MANIFEST 40. For example, Fastenal (FAST) moved from #15 to #12 over the last three months. What companies are making the strongest gains among this consensus collection? This may be indicative of strong fundamentals (combined with attractive prices and returns) and probably warrants further study. The companies making the largest advances (by percent of dashboards) since 9/30/2012 are: Res-Med (RMD), Coach (COH) and Bio-Reference Labs (BRLI). The newcomers this quarter are Intuitive Surgical (ISRG), Paychex (PAYX) and QUALCOMM (QCOM). The tracking portfolio (dashboard) for the MANIFEST 40 can be found here. Mayans! 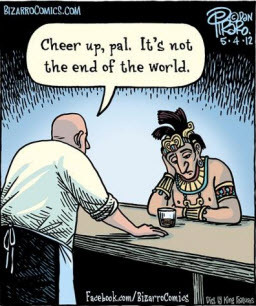 Well played, Mayans. Well played. First we had the Rapture a few months ago. And now, December 21, 2012 has come and gone. As the last few hours of 2012 wane, we’re still here. We’re either heathens (avoiding the Rapture) or the Mayan Mother Ship got lost on the way back to pick us up. But we’re still here. At least you and me, dear reader. Perhaps our elected representatives have been counting on one or the other — while indulging in that multi-decade game of “kick the can” (down the road). Take it from one champion can kicker from the early 1970s … they’re not very good at it. Not really. We got lots of questions about the fiscal cliff during the December 2012 Round Table session held this past Saturday morning. So it’s on the minds of many of you. Hugh McManus compared to something to do with flinging tomatoes to see if they’ll land (???) or something like that. One of my favorite depictions comes from Eddy Elfenbein who calls it a fiscal slope, not a cliff. 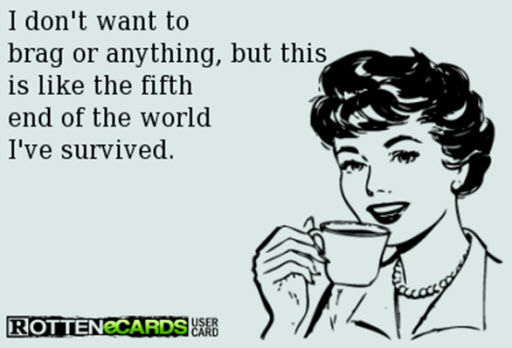 And there’s not really a hard deadline — at least not in the context that’s being delivered to us. I think of it as (1) a dramatic display of incompetence and (2) an epic bipartisan abrogation of responsibility. In the Big Picture scheme of things, it’s material and a better plan needs to pursued and we need to unleash American energy in time-honored ways or we’ll face serious challenges ahead. But, it’s not the end of the world and neither are the forty two other things you’re being told to worry about these days. During the Round Table, we celebrated something pretty cool. The overall relative return for our stock-selecting knights and collaborators has been mired since inception. It has generally ranged from -2 to -4 percentage points and languished over time. (Drum roll) We’ll close 2012 with a COLLECTIVE relative return (since inception) of +1.8%. During the session, we added Coca-Cola (KO), Mesa Labs (MLAB) and Staples (SPLS) to the tracking portfolio. Adding one of the world’s strongest and established brands, one of the best companies from October’s Forbes Best Small Companies and accumulating Hugh’s favorite deep value play all seem like appropriate things to ponder during these “final days.” Steady. Promising. Beaten down but with potential. Hugh’s perspective is uncommonly long-term. He sees stabilizing growth, a steadying and modest growth of the Staples store portfolio … restoration of profitability and a potential that a P/E expansion (currently 8x) could accompany a resounding recovery. The low total return forecast is approximately 30% if these dominoes fall into place and Hugh openly admits that he doesn’t know when … or IF … this will happen — only that there’s a finite probability that it could. Ken Kavula lamented the 24/7 news cycle during our discussion of how faith in investing has leaped from a bunch of people who need it most. And we’ve all been around long enough to know that opportunities are created (close your eyes and think back to March 2009) when it’s darkest before dawn. PIMCO’s Bill Gross recently clarified that he didn’t mean that “stocks were dead,” but that “the cult of equities was dying …” and with that some of the excesses and exuberances just might be obliterated, at least for a while. 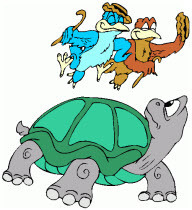 Those who leap with a little faith and prudent analysis just might discover and live an interesting journey. And unless you’re in the shadow of the Mayan mother ship, there’s another dawn ahead and no better time to plan, prepare and select some opportunities to live through in years and decades ahead. Why do we pay attention to the Value Line weekly updates? Because a number of highly successful long-term investors cite Value Line as one of their favorite trusted resources. “I don’t know of any other system that’s as good… The snapshot it presents is an enormously efficient way for us to garner information about various businesses… I have yet to see a better way, including fooling around on the internet, that gives me the information as quickly.” — Warren Buffett, Berkshire Hathaway, 1998 Annual Meeting speaking about The Value Line Investment Survey. In our case, we’ve found the low total return forecasts for all companies to be among the most compelling opinions/forecasts while we either (1) search for opportunities or (2) practice effective stewardship when it comes to staying vigilant about our current holdings. And in this case — this week — we find an outsized number of opportunities as the average Value Line low total return forecast (11.5% as shown in the accompanying figure) for the companies in Issue 7. Our experience is that the S&P opinions are more reliable when it comes to non-core stocks and/or special situations. The Morningstar analysis seems to correlate more closely with our methods when it comes to core stocks. In the case of Staples (SPLS), we’d lean towards the S&P judgment and agree with Hugh McManus. Hugh presented Staples as his featured stock for the December 2012 Round Table — fully noting and disclosing that challenges lie ahead. We’ll take a closer look at Staples (SPLS) with a full analysis as well as Intel (INTC) as it appears relatively well-positioned here. 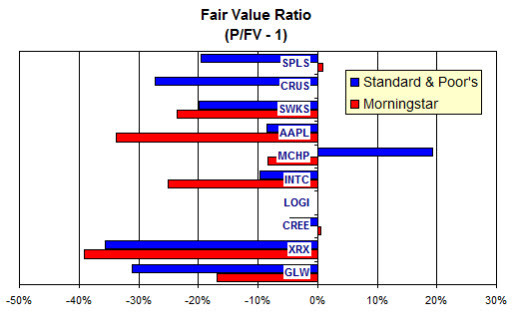 Note the different opinions from S&P and Morningstar on Apple (AAPL). As noted, for special situations — we’d place more credence on S&P in these situations, and see Apple (AAPL) as less undervalued than most people think it is. Happy New Year, to stock hunters everywhere! May the new year find good hunting and exceptional returns. The 11th stock in our Christmas Countdown is Cherokee (CHKE). As the Motley Fool suggested a while back, you have to “look beyond the earnings” (translation: weak track record in recent years) when performing analysis on Cherokee. The company has clearly struggled while at the same time making considerable progress in recent quarters. The new acquisitions and relationships seem to be taking hold and if the company can regain some of its luster of a few years ago, significant price appreciation (along with above-average dividends) are possible here. We know about turnarounds and our expectations are conditioned accordingly. That said, every one in a while it’s OK to reach for a Christmas miracle. With a sales growth forecast of 6% (that could easily ramp to 6-12%), a net margin of 29.3% and a projected P/E ratio of 15x, the long-term return forecast is 19-20% (per annum). From the time-honored vault: Originally published on 12/14/2010, this entry into that year’s Christmas Countdown carried a powerful reminder about the sometimes silent power of long-term investing. The second company in our 12-day Christmas Countdown is Abbott Labs (ABT). Abbott Labs has been featured prominently at Manifest Investing in our Sweet 16 screening results for the December newsletter and ABT has been selected twice for the MANIFEST Round Table (more on this to follow) and we regard the company as a core, or bolstering, holding with consistent steady results over the years … Speaking of “over the years,” I don’t know about you, but I get a little reflective and nostalgic as December marches on and the new year approaches. In this case, our selection of Abbott Labs gives us an opportunity to revisit a story shared by Sharon Serres back in March with the MANIFEST community. It’s the story of Grace Groner — one of those legendary literary little old ladies. Grace worked for Abbott Labs and had done so for decades, holding a few shares that she’d purchased decades ago. I don’t know what other stocks may have resided in her portfolio, but when Grace passed away earlier this year, she left behind an awesome gift for her alma mater, Lake Forest College. It’s seems fitting to me to celebrate a little grace (in this case, a LOT of grace) during the holiday season. No stranger to investors in our community, Abbott Labs (ABT) is a global, broad-based health care company devoted to discovering new medicines, new technologies and new ways to manage health. Products span the continuum of care, from nutritional products and laboratory diagnostics through medical devices and pharmaceutical therapies. The comprehensive line of products encircles life itself – addressing important health needs from infancy to the golden years. ABT is recognized as a global enterprise with the ability to serve customers around the world. Throughout its 120+ year history, Abbott people have been driven by a constant goal: to advance medical science to help people live healthier lives. It’s part of their heritage. Today, approximately 90,000 employees around the world share the passion for “Turning Science Into Caring.” It’s a commitment to focusing on what matters most: life and the potential it holds when we are feeling our best. Q: Why do we do stock studies? A: To build a vision of what a company (stock) might be worth in the future. That vision includes two core components: a five-year earnings forecast … and an estimate of the average value (projected P/E ratio) that we believe investors will be willing to pay — based on our assumptions, judgments and careful considerations. Any stock study is basically a fill-in-the-blanks quiz. If (company name) can grow sales at ____%, achieve a profitability of ___% for net margin, and if a reasonable price-to-earnings ratio (P/E, essentially the foundation of the value of any company) would be _____x … then the projected annual return (PAR) could reasonably be: _______%. In the case of ABT, our answers are (1) 9% … (2) 18% … and (3) 15x … for a result of 17-18% projected returns. We look forward to discovering a little more grace and formidable long-term investments like Abbott Labs during our Round Table session. File it under Christmas Miracle: French Connection. The 10th stock in our annual Christmas Countdown is Resources Connection (RECN). “Bon pour vous revoir, Monsieur Manifest! “Enough with the idle bavardage, is Woodward around this year? Resources Connection operates under the name Resources Global Professionals and provides finance, accounting, risk management, internal audit, information technology, human resources, supply chain management and legal professionals to clients on a project basis. It has 82 offices in 20 countries. Looking back over the last several years, it’s clear this company is attempting something of a “retool” and the global recession put quite a dent in 2009. If RECN can achieve anything approaching 6-8% growth and deliver 7% bottom line margins while achieving a projected average of 19-20x, a long-term return forecast of 20% is feasible. 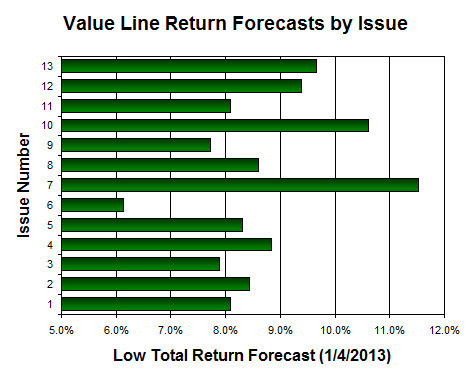 The Value Line low total return forecast is 24%. The 9th stock in our annual Christmas Countdown is MOCON (MOCO) an all-time favorite of champion long-term investor Charles Allmon. MOCON is the type of company that can provide a solid contribution from smaller (and generally faster-growing) companies as we balance our selections. And in this case, MOCON makes measurement, analytical and monitoring consulting products and services worldwide. I think MOCON is suffering one of those occasional speed bumps that any and all companies experience during their life cycle. 2012 will be unkind. But it’s interesting to note that the “P” has not fully followed the “E” in the visual analysis. That’s an indication of faith in the long term and a return to the longer term trend for the core characteristics. MOCON also gives us the chance to nod in the direction of Charles Allmon. Chuck, known by many of us as dancing bear — is clearly one of the most successful stock pickers that few know and/or talk about. I know that many of you are an exception to that and celebrate/cherish Chuck’s contributions to the pages of Better Investing magazine over the years. A little while ago we looked at a portfolio published in Forbes near his the date of his retirement and we can still marvel at the results and track record. Since November 2008, $1200 has become $3604 … an annualized rate of return of 30.8% and a relative return of +10.3% versus the Wilshire 5000. Yes, Virginia, you’re permitted to applaud. When it comes to stock selection and phoning-a-friend, the smartest calling birds that I know would dial up Charles “Dancing Bear” Allmon in a heartbeat.